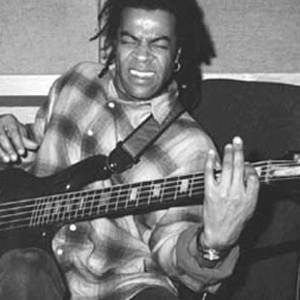 Doug Wimbish (born September 22, 1956) is a bass player, primarily known for his studio work for the rap/hip hop label Sugarhill Records and his membership of the band Living Colour. He has played for a vast range of artists, among which Mick Jagger, Madonna, Tarja, George Clinton, Depeche Mode, and Mos Def. Wimbish is considered to be a pioneer in hip hop bass playing and in the use of effects with bass playing. Born in Hartford, Connecticut, Wimbish started playing guitar at the age of 12 and switched to bass guitar at the age of 14. In 1979 he was hired together with guitarist Skip McDonald and drummer Keith LeBlanc to form the house rhythm section for Sugarhill Records. Although they did not play on the Sugar Hill Gang's famous song "Rapper's Delight" (the rhythm tracks for this song were played by the group Positive Force), they did play on all the other famous tracks like for example "The Message" by Grandmaster Flash and the Furious Five, "White Lines" by Grandmaster Flash and Melle Mel, "New York, New York" by Grandmaster Flash and the Furious Five, and "Apache" by the Sugarhill Gang. Together with McDonald and LeBlanc, Wimbish headed to London in 1984 and started working with producer Adrian Sherwood and formed the group Tackhead. Together with Tackhead and as a session bassist, Wimbish found himself in demand as a bass player for many artists and was considered as a permanent sideman for the Rolling Stones after the departure of bassist Bill Wyman in 1993; although the job went to Darryl Jones, Wimbish later played on the Stones' 1997 album Bridges to Babylon. Wimbish joined Living Colour in 1992 (he replaced Muzz Skillings, who left the band) to tour and record one album, Stain, not long after which the group disbanded. Wimbish joined his old Sugar Hill Gang partners to play in Little Axe, an ambient-dub project initiated by Skip 'Little Axe' MacDonald. After the disbanding of Living Colour, Wimbish went back to London to continue his career as a studio bassist. In 1999 he formed the drum and bass group Jungle Funk together with drummer Will Calhoun and percussionist/vocalist Vinx. Also in 1999, Wimbish solo album Trippy Notes for Bass was released. In 2000 Living Colour was reformed with Wimbish as the bass player and toured in the United States and in Europe. In 2001 and 2002 Wimbish recorded and played with rapper Mos Def. Wimbish also formed Head>>Fake, a drum and bass project with drummer Will Calhoun. They released a CD called 'In The Area'. In 2005 they started recording new songs. March 2008 Doug Wimbish' second solo album will be released.